This is not a comprehensive list of my favorite authors. This list focuses on those whose works were foundational to me as I developed my style of storytelling. When I consider what I have written and plan to write, I see these writers between the words. Because I am focusing on the foundational influences, this list skews to storytellers I discovered when I was young. It also means that many authors I discovered later or simply enjoy as a reader are not included. I watched Jurassic Park 4 times in theaters, and I read the novel in 6th grade. It marked my transition from teen to adult books. I was drawn to the suspense and grounded sci-fi adventures. 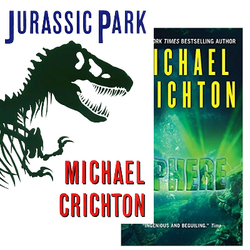 Most significantly, it was while reading Crichton's books that I determined I would become a writer. I wanted to one day see my novels in bookstores and know my stories were exciting readers around the world. I first attempted to write a book around 8th grade, and while the settings and characters were unique, the plot was clearly influenced by Jurassic Park. The grandfathers of horror. 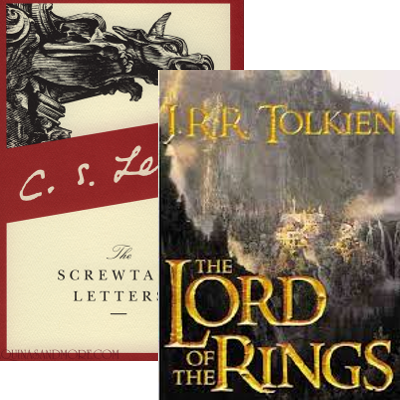 Sure, others have been equally influential in the genre, but these two writers influenced me. Instead of focusing on macabre violence or relational nightmares, my style of horror typically reflects the old masters: dread, suspense, monsters, insanity, fear of the unknown, and darkness of the human heart. Poe was the first horror author I read, and his stories were my favorite reading assignments in school. I discovered Lovecraft later in life. I was drawn to his imaginative creatures and cosmic-level sense of fear. I didn't get to watch a lot of Rod Serling's masterpiece, The Twilight Zone, when I was growing up, but I loved what I did see. The show's ambience, its growing tension, and its slightly disjointed and creepy deviation from reality all stuck with me. Furthermore, I loved that each episode made an interesting point in a creative way, even if my own style is less overt than Serling's end-of-episode sermons. I first learned about Rod Serling because I'm from the Binghamton, NY area, and he's treated as a local legend here. This is his birthplace. Mr. Serling was a unique and gifted storyteller whose footsteps I'd be proud to follow in. The Inklings duo. Tolkien was one of my earliest forays into the fantasy genre. Like most of his fans, I was impressed by his world-building, gorgeous maps, epic tale, and prose. I didn't start with the Chronicles of Narnia or Mere Christianity like most Lewis fans. I once suggested that a book written from a demon's perspective would be a great way to analyze Christianity and present apologetics concepts. Then my friend asked, "Have you ever read The Screwtape Letters?" That was where my Lewis journey began. Lewis's essays are deep yet accessible, and his fiction does a good job of juggling apologetics and narrative. He is one my biggest influences, though my stories are less overt and more bloody than his. That's why I've described my style and "Lewis with a higher body count." I mentioned above that my style is "C.S. Lewis with a higher body count." This is where the body count comes in. 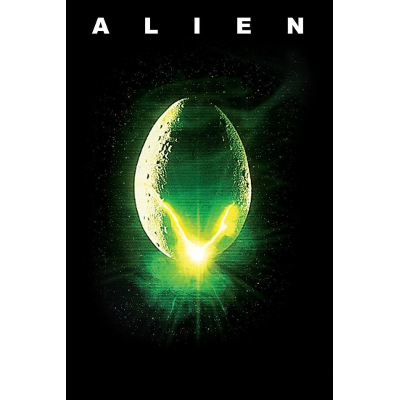 ​O'Bannon and Shusett wrote the 1979 classic film, "Alien." Still a favorite of mine to this day, it's one of those films I not only remember vividly, but actually remember what it felt like when I watched it for the first time. The bizarre, claustrophobic, otherworldly terror is perfect. The best part of the film is the alien. I love a brilliant creature design, and the xenomorph is, in my opinion, the greatest monster creation of all-time. It inspires fear, wonder, a sense of genuine existence, and connections to the movie's themes. Monsters feature prominently in my stories, and I hope to create some that become at least half as iconic as the xenomorph. I've been a gamer since the days of Atari. While video games have come a long way since then, most are still not masterpieces of storytelling. What they specialize in is interactive experiences, but that in itself can be an inspiration to stories in other mediums. 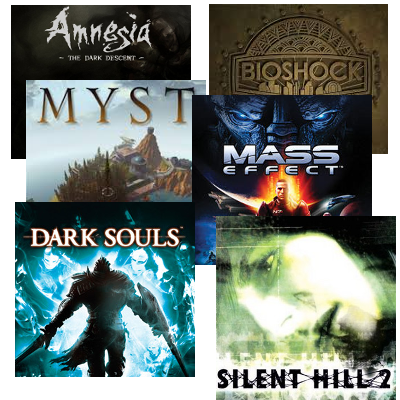 Here are the games that have most affected the stories I tell. Amnesia: A backdrop of Egyptian archaeology and a suffocating escape from horrors in a Gothic castle. A slow revelation of how your past intertwines with the present nightmare. The frightening helplessness of not being able to fight back against that which pursues you. All this, plus the most hilarious reaction videos on YouTube. Bioshock: Atlas Shrugged come to life. A well-developed world of science without the impediment of one's conscience. And would you kindly give a round of applause for one of the sliest twists ever in a story. Myst: Uncovering a hidden past by means of exploration and problem-solving in imaginative but barren worlds. Mass Effect: I love Star Wars, and I have great respect for Star Trek, but this is the sci-fi IP I most want to see expanded. Spectacularly realized worlds and aliens. Well thought-out interplanetary culture clashes. A storyline (and some side storylines) that blows away the average sci-fi summer blockbuster. Dark Souls: A story that is felt, uncovered, and experienced rather than observed. Top-notch creature and setting designs, heavy atmosphere, moving revelations, and a complex history that is realized through the slightest of details. Silent Hill 2: A tale of consequences and lived-out nightmares tied to a character's slowly-revealed past. Monster designs that connect directly with the protagonist's psyche and regrets. Utterly unnerving settings and atmosphere.